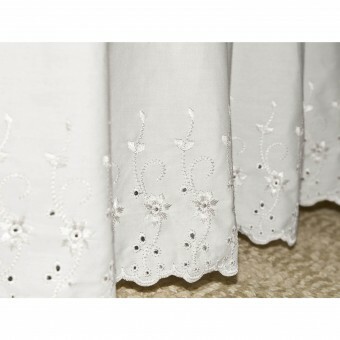 Enjoy the quaint style of our embroidered eyelet ensemble, complete with matching bed skirts and pillow shams. The most fun aspect of dressing a bed is being able to choose the pieces you use. Whether it be zebra print pillow shams or a neutral beige duvet cover, you can mix and match and have a blast! 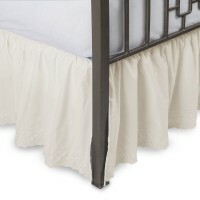 The bed skirt is no different, and I find that a neutral, traditional piece is best to anchor the look of your bed. 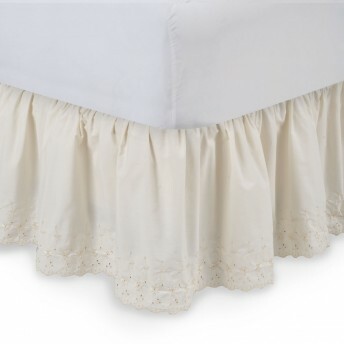 That is why I recommend that you invest in this eyelet embroidered ruffled bed skirt. The choice of bone or white ensures that you can blend it in with the classic or funky elements found elsewhere in your room. The eyelet design is simple and understated, yet gives the piece a look of distinction. Thanks to the continuous corners, it will look great from all angles. From 14" to 21", there are three different drops available. This skirt is going to turn your bedroom from good into amazing overnight! No bed is complete without a bed skirt, and this eyelet ruffled bed skirt with split corners is the one which you need to buy today. Why? 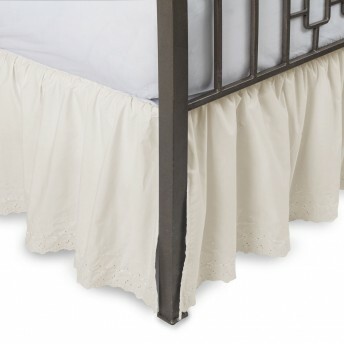 The first reason is that the eyelet design is elegant and classic, adding a beautiful look to the bottom of your bed. The second is that the split corners ensure that the skirt looks its best at all times, plus it will be easy to get onto the bed and into the right position. Another great feature of this skirt is the fact that it comes in two neutral colors, allowing it to look great with any other colors you may have in the room. Lastly, the fact that it comes in two heights will make it the perfect size for your bed's height. With such a low price on this piece, you can not only have one for your bedroom, but also for the other rooms in your home. 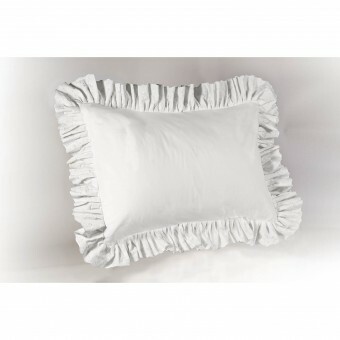 When you want to add a touch of elegance to your bedroom, look no further than this eyelet ruffled pillow sham. 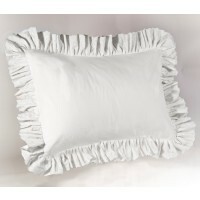 Available in a luxurious array of colors, this is the sham which will set your room's decor on fire. Whichever size of pillow you currently have, there is an option to fit it as snug as a bug in a rug. Two fabulous colors, Bone and White, are available to ensure that any color palette you have in your room will be not only matched but enhanced. 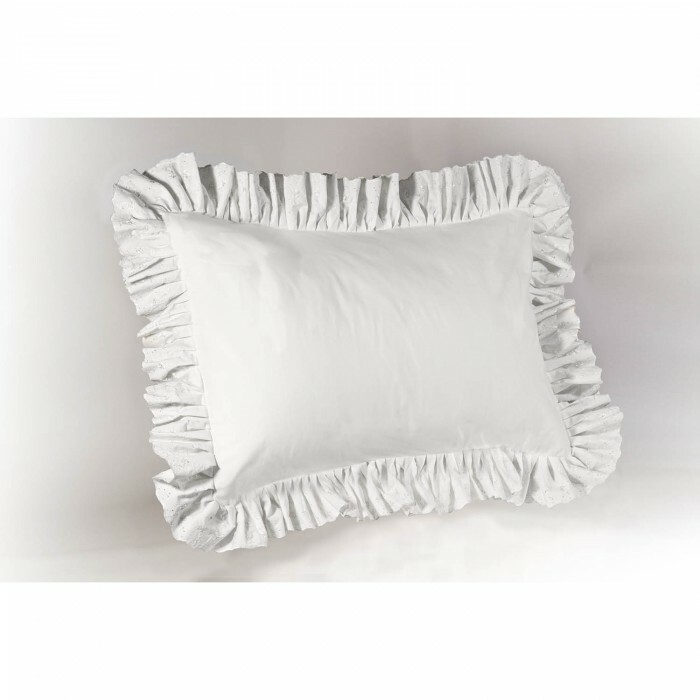 The soft and durable cotton/polyester mix used in the fabric will ensure durability as well as comfortable use. The beautiful eyelet pattern will ensure your eyes are as happy to look upon your pillow as your head will be to rest on it. 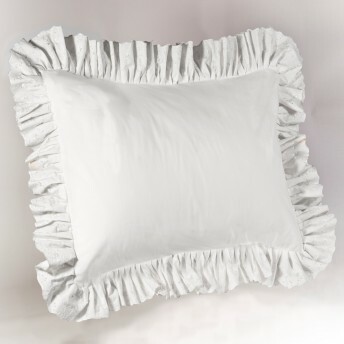 Combining all of these amazing features makes this the pillow sham you need for your own bedroom, your guest room or even on your sofa. Item exactly as advertised. Could not have been happier with my purchase. I am extremely pleased with the quality of my new bedskirt. I have a antique bed and needed a extra long bedskirt for it. The skirt that I ordered from you is absolutely perfect. The fabric ironed up beautifully and sent a photo of it to my sister in Dallas. She agreed with me as to how pretty it looks on my bed. I would recommend your company to any of my friends. This eyelet bed skirt is lovely. It fits the bed great and drapes nicely.